After seeing the beautiful hand saws Brian of BearKat Wood creates, I offered him a trade for some forging. He took me up on the offer and I set out to make him a fancy drawknife. I initially forged a tiny one just to learn the process, then moved on to making these two. I sent the larger one to Brian and kept the smaller for myself. 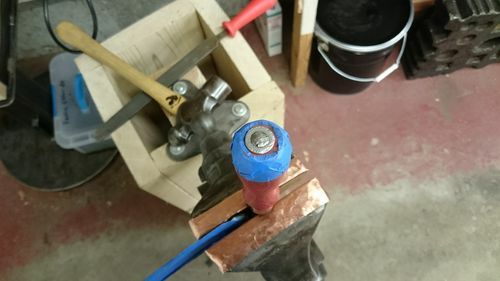 I made these drawknives from bicycle chain forge welded to good tool steel backers for the cutting edge and extra strength. 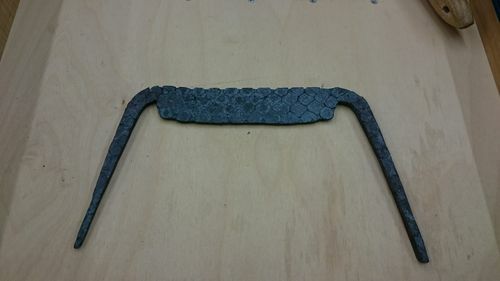 This is known as “chain damascus” in the knifemaking community. The smaller one has an antique file as the backer (W1 steel most likely), while the bigger one has a 1080 steel backer. It’s all hand hammered by my feeble arms on an anvil, as I don’t have a power hammer or press. I heat treated the blades by heating to non-magnetic (about 1500 deg F) and quenching in warm oil, then tempered at 425 deg F in the kitchen oven, followed by softening the tangs in the forge. I acid etched the blades after polishing to bring out the link and rivet patterns. The handles are turned out of redheart with copper ferrules, finished with amber shellac and renaissance wax. 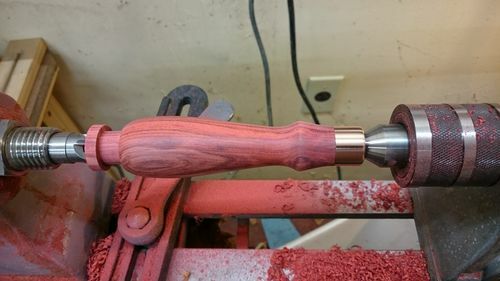 I drilled them out on the lathe most of the way through, then continued the hole from the other end freehand. On the smaller drawknife I chiseled out the remaining area to insert the tangs (which didn’t fully work, one of the handles cracked and needed repair), while on the bigger one I burned them to fit by heating the tangs in the forge and inserting repeatedly (being careful not to damage the temper on the main knife body). The tangs pass clear through the handles and are peened over washers to clinch the handles in place. I also used medium CA glue in the hole to keep them extra secure. In exchange, Brian sent me a beautiful 13 ppi tenon/carcass rip saw with a goncalo alves handle custom fit to my hand. It is incredible, I admire it every time I enter the shop. Thanks a lot, tool brother. Beautiful work, thank you so much for my new favorite tool. Absolutely awesome! I’ve never heard of this process but it makes sense. Your build photos were also good. Thanks for sharing. Beautiful multi-craft work takes my mind back to my old fab shop days, Great work you did here. I wouldn’t have believed the part about the bicycle chain without the proof. Allen, those are jaw dropping gorgeous. Incredible work. Quite amazing. They are a functional work of art. 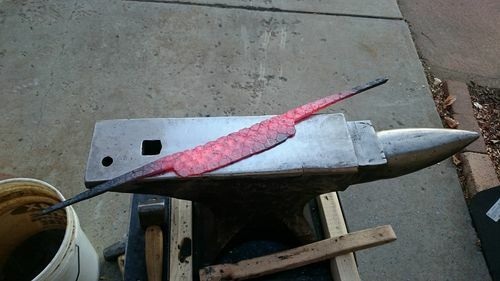 Makes me want to start blacksmithing. Woodworking is taking up all of my free time already. They are very cool. Do you think you can bring yourself to use one? These are absolutely beautiful tools great work! Amazing work Allen. That was a good trade you guys. 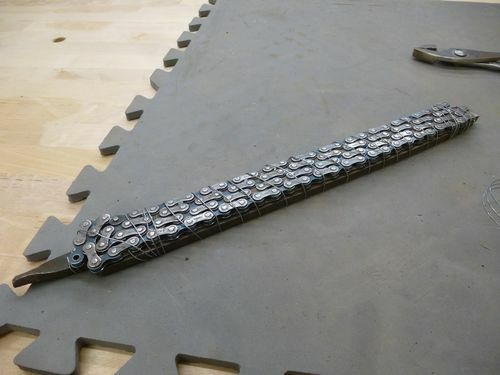 Awesome idea with that bike chain. Extraordinary work and looks realy interesting. Turning part of project is also very well made. These are beautiful tools and you’ve done a fine job on them. The handles look great. Stunning work. You’re really forging ahead aren’t you?